This is an English translation of the thamizh prose given for “srI aruLALamAmunigAL’s gyAna sAram – pramEya sAram based on srI maNavALA mAmunigaL’s vyAkyAnam’, as written due to his nirhEthuka krupai by srI U.Ve. Vidwan V.K. 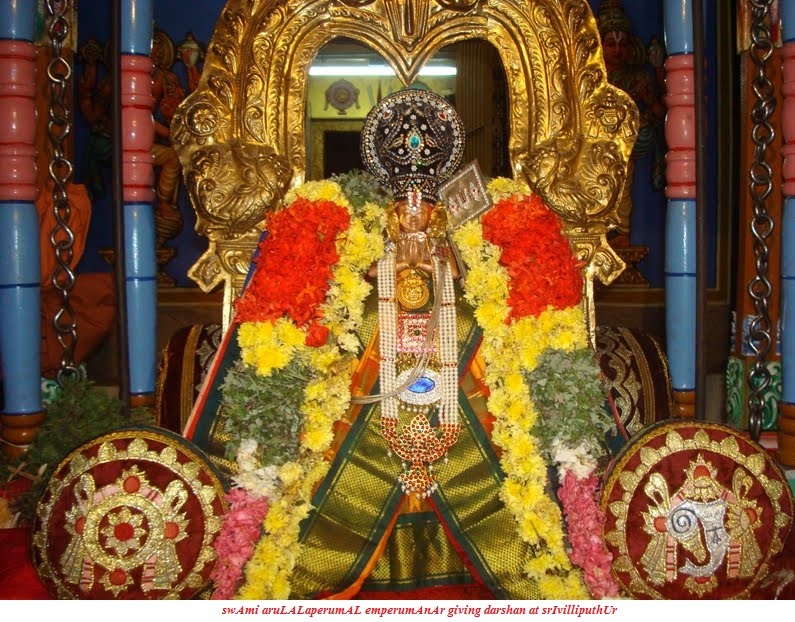 Srinivasachariar swamy of sri aruLALaperumAL emperumAnAr thiruvamsam at srIvilliputhUr. 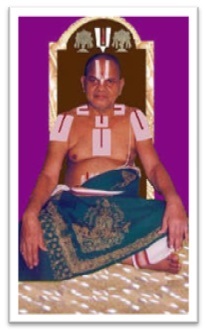 kIrthi mUrthy Swami Srinivasachariar is a kumArar (son) of 31st pattam srImadh ubhayavEdhAntha vidwan thirumalai vinjimUr kuppan iyengAr (kuppuswAmy thAthAchAr) swamy. The thamizh prose by vidwan V.K. Srinivasachariar was published in 2003 panguni-uthrattAdhi, as part of 100th year celebration of Sri U.Ve.kuppuswAmy thAthAchAr. Text from the original thamizh book, and this translation in English and other languages, are being propagated with permission and blessings of the srI U.Ve. V.K. Srinivasachariar’s kumArar, vidwan srI U.Ve. V.S. Venkatachariar swamy who is decorating 33rd pattam residing at srIvilliputhur thirumALigai, and doing continuous kainkaryams at srinivAsar sannidhi and aruLaLa perumAL EmperumAnAr (aruLALAmAmungaL) sannidhi that are at srI kuppan iyengAr maNdapam in srIvilliputhur. 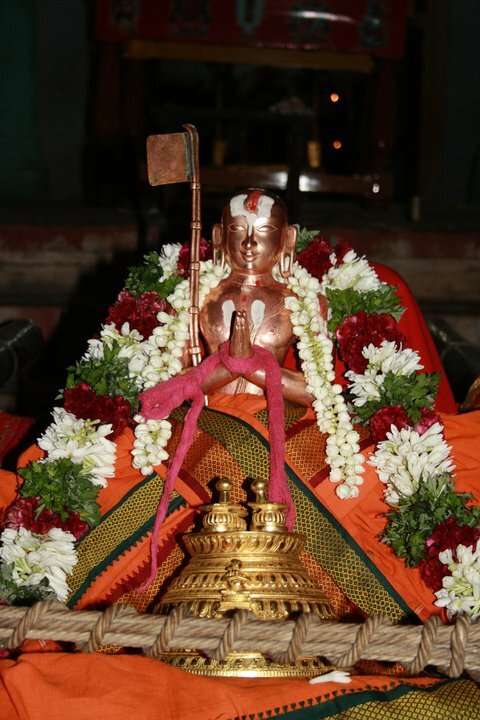 English translation – santhAnam rAjagOpAlan rAmAnuja dhAsan. This entry was posted in gyAna sAram, Other on November 14, 2014 by santhanam rajagopalan. Thank you for the effort you have taken in giving us this wonderful composition of Arulaala Perumal Emperumanar. It would be wonderful if it would be possible for you to provide us the remaining five verses of Gnana Saaram. Please treat this as the request of a humble devotee. Thank you once again for the yeoman service you have done. I have not been able to find any other resource for this composition on the web, except yours. thanks for the feedback. gyAna sAram is translated by mayuravalli ammangar/santhanam swamy couple as part of our srI rAmAnuja dharsanam magazine – http://www.varavaramuni.com/home/sriramanuja-dharsanam-magazine. We will be completing this prabandham in the near future and will prepare e-books in multiple languages as well.